Nestled on the beach, this Churriana hotel is within 3 mi (5 km) of Parador Malaga Golf Club, Los Alamos Beach, and Jose Maria Martin Carpena Arena. Parque del Mar and Picasso Park are also within 6 mi (10 km). All inclusive vacations don’t have to come with a high price tag. Travelocity is here to help you find the best deals on all the top all inclusive resorts in Malaga so you can spend more time relaxing in the sun, and less time worrying about how much you’ve spent. Get the most out of your stay with our deals on Malaga all inclusive hotels! 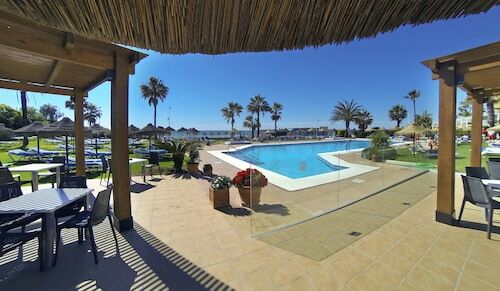 Sol Guadalmar: has a guest rating of 4.00 out of 5 stars. Book affordable rates at Sol Guadalmar, which has a rating of 4.00 out of 5 stars based on traveler reviews. Our trusted ratings and reviews from guests help you book your stay in Malaga all inclusive resorts with confidence! With over 1 hotels and resorts to choose from, you’re sure to find the perfect destination for your next trip.